Arriving Europeans plundered Australia for human bones to show in their museums. They took skeletal remains of thousands of Aboriginals. Not surprising the descendants of the deceased Australians want to bury them in this country. 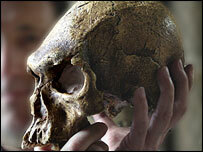 Because most "specimens" were taken over recent centuries, the DNA in them is still detectable. Tests are being done to compare DNA from bones with Aboriginals living today in order to find matches. The work is being done by Griffith University in Queensland. Though only a few matchups have been done in the world - remains were returned to North American Indians using the method - native people are interested in doing it. Tapij Wales an elder of the Thanynakwith people in Cape York requested tests be done. The main problem is that many claiming Aboriginality today have a mix of European and Aboriginal genes. Moreover, many natives were removed by European settlers to other regions. The arrival of new settlers was a violent period in Australia's history. DNA samples for 27 Aboriginal ancestors were taken. The oldest was 1540 years old. The places of origin of the remains were known. Mitochondrial genomes passed down through the mother gave vague results. The nuclear genomes testing proved much better. They could reliably be matched with regional Aboriginals extant today. Genetic material bones used locate living descendants remains’ repatriation, researchers showed. Carolyn Wilke. Dec 20, 2018 Willandra Elders visit laboratory ancient DNA. DR. RENEE CHAPMAN. bones hundreds, thousands, indigenous Australians remain museums worldwide, shipped European colonization. Descendants want remains returned face difficulty proving origins. DNA help identify communities they belong, researchers report (December 19) Science Advances. Mining ancient DNA links living people tricky - DNA degrades time colonialism disrupted family ties indigenous peoples were removed their land, making more difficult know look descendants, Science reports. addition, many culturally indigenous people have large amounts DNA European ancestors. Scientists Griffith University Australia analyzed genetic material remains Aboriginal people. remains repatriated previously unearthed directly, origins were known. researchers able sequence mitochondrial DNA remains, capture nuclear genomes 10.
team able match nuclear genomes communities nowadays live same land remains came, showing genetics useful repatriation cases Australia. connections found mitochondrial DNA didn’t prove clear, correct match only 60 percent cases. researchers envision collecting genomes living Aboriginal people form database. they screen genetic material remains, Science reports. This allow repatriation remains even identifying information has been lost. Repatriation sacred objects human remains has become Australian government policy. The first set remains repatriated 1 total 2,500 have been returned, Nature reports. using DNA repatriation would likely desired indigenous peoples worldwide, unclear well searching ancestral links DNA would work places. instance, genetic ties different indigenous groups Polynesia close difficult match ancestor community, Science reports.